This tour is accompanied throughout by an experienced multi-lingual tour director and a physician travelling on the train. A sophisticated on-board program complements a comprehensive excursion and sightseeing package to make your journey truly memorable. No reviews yet for this trip. Browse other reviews below for Transsiberian. You are greeted at the airport by your friendly tour director and accompanied to your centrally located 4-star hotel (guests in the Bolshoi categories stay in the 5-star Westin Hotel or similar quality accommodations), where you have a pause to relax. The tour through Beijing shows you many of the colourful facets of this large metropolitan city. The highlights are certainly the Temple of Heaven and history-laden Tiananmen Square, two of the city’s most famous sights, but it also includes recent achievements in the area of contemporary architecture, such as the new “Bird’s Nest” Olympic stadium, and several of Beijing’s futuristic sky scrapers. Afterwards you enjoy a mutual dinner to welcome you to the tour. You spend the night in a hotel in Beijing (4- or 5-star, depending on booking). Today you visit the Great Wall, the eighth wonder of the world. The giant wall extends for more than 6000 km through the countryside. On the way you visit the UNESCO World Cultural Heritage Ming Tombs and the Spirit Way. In the evening you dine on the well-known delicacy of Peking Duck. You spend the night in your Beijing hotel. For centuries, the gates to the Forbidden City were closed to the public. Today you have the morning to view its awe-inspiring halls and mysterious temples. In the evening your rail journey begins, as you transfer to the train station and depart for Mongolia aboard a chartered Chinese train. You reach the border city of Erlian in approximately 16 hours, on the following day. You spend the night aboard the train. Around noon you reach the Chinese-Mongolian border, where you transfer to the Tsar’s Gold private train. The change of trains is necessary because of the different track gauges in the two countries. In the growing city of Erlian, you have some time to explore the colourful local market, before your Russian train sets off towards Mongolia. After crossing sections of the legendary Gobi Desert, the train travels through the vast green steppes of Mongolia. You spend the night aboard the train. 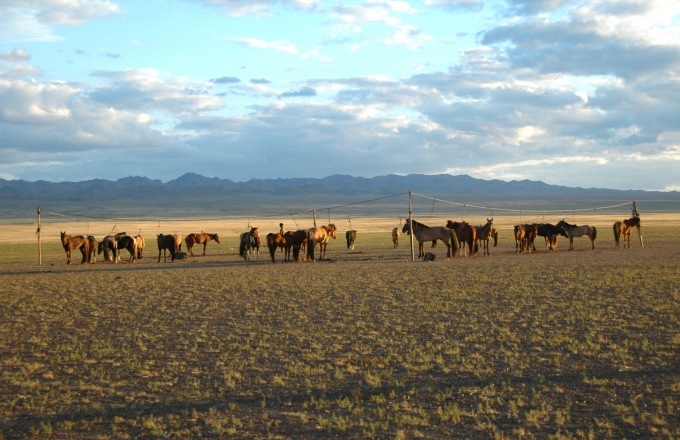 Early-risers are treated to central Mongolia’s spectacular scenery. In the morning you arrive in Ulan Bator, the capital of Mongolia. You can leave your large luggage securely in your compartment. During your city tour you see the impressive Gandan Buddhist Monastery and the odd Choijin Lama Temple, among other things. In the evening you have the unique change to attend a performance of traditional Mongolian folk arts, including throat singing, horse-headed fiddle playing, national costumes and dances. You spend the night in a 4 star hotel in Ulan Bator. (BLD) On request, we can organise alternative lodging in a yurt in the beautiful landscape of the Mongolian Alps. This is a rare experience and a dream come true for nature lovers. After breakfast you visit the Gandan Monastery, where it is possible to observe a Buddhist religious ceremony. Your bus then takes you to the Mongolian Alps, located some 90 minutes east of Ulan Bator, with their majestic scenery and bizarre rock formations. After a picnic lunch in a yurt camp, you watch a small Mongolian horse-riding demonstration and a traditional wrestling match. You spend the night aboard the train. You take your leave of the Mongolian steppes today. You travel through the valley of Mongolia’s largest river, the Selenga, You are on the way to Ulan Ude, where your train reaches the main route of the Trans-Siberian Railway. Here you take an informative city tour. You spend the night aboard the train. Today is spent exploring the remarkable natural phenomenon of Lake Baikal, the largest reservoir of freshwater in the world. In the morning your train travels directly alongside Lake Baikal, on the old route of the Trans-Siberian Railway. During two extended photo-stops, you have a chance to explore and record the scenic beauty of the lake and its setting. A short boat excursion from Port Baikal takes you out onto the lake. Take a swim in the lake, if you wish, and visit a picturesque Baikal village. Dinner is a Baikal-style picnic on the lakeshore with a view of the incredible natural surroundings (weather permitting). You spend the night aboard the train. In the morning, you arrive in Irkutsk, the capital of Eastern Siberia in tsarist times. Here you move into your hotel, which is simple, but central and nicely located. You can safely leave your large baggage on the private train. During your city tour you see the Okhlopkov Drama Theatre, the new memorial to Tsar Alexander III, and the photogenic market hall. Around noon you pay a worthwhile visit to an open-air museum with a focus on life and work in historical Siberia. You spend the night in a 4 star hotel in Irkutsk. After breakfast your train passes through the diverse landscapes of eastern Siberia. Talks on board inform you about the region and a vodka tasting with typical Russian snacks is an opportunity to experience firsthand the Russian festive customs of hospitality and clever toasts. You spend the night aboard the train. Around noon, your train arrives in Novosibirsk, the largest city in Siberia. You are greeted with bread and salt in the customary Russian manner and taken on a tour of this most Soviet of cities along your entire route, including the chance to see the mighty Ob River. You spend the night aboard the train. Your train stops in the afternoon in Yekaterinburg, the capital of the Ural Federal District. The city is known as the place where the Russian tsar Nicholas II and his family were murdered in 1918. During a tour you see the Cathedral of the Saviour on the Spilled Blood, which was built in 2003 to commemorate that tragic historic event, and the city centre attractively restored in 2009. Back on board, you enjoy views of the Urals landscape and indulge yourself in the dining car. Your private train is already rolling across the European continent. You spend the night aboard the train. After breakfast you reach Kazan, the Tartar capital on the banks of the Volga. On your city tour you see Tartar mosques and the most famous Russian Orthodox cathedral. You also take a tour of Kazan’s Kremlin, where you learn about the turbulent history of the relationship between the Tartars, the Cossacks, and the Russians. Afterwards you enjoy lunch in a city restaurant. You spend the night aboard the train. Around noon, you arrive in the Russian capital of Moscow, now a thriving, prosperous city, and are accompanied to your 4-star hotel (guests in the Bolshoi categories IV and V stay in the 5-star Hotel Kempinski or similar quality accommodations). At noon you visit the Kremlin grounds with its magnificent cathedral. Several of the building interiors can also be viewed. After dinner, discover the city’s magic during an hour-long “City of Lights” tour, including a stop at Red Square, and a ride on the underground to view two of Moscow’s particularly beautiful metro stations. You spend the night in a hotel in Moscow.